1. Make the jelly first as it needs two hours to set. Line a baking tray with cling film. Heat the agar agar and water in a saucepan over a medium heat. Bring to the boil, whisk until the flakes disappear, remove from the heat and add the orange juice and sugar. Whisk until combined, pour onto your lined baking tray and place in the fridge until set. 2. Preheat the oven to 180°C (360°F). Grease two non-stick muffin trays with coconut oil. 3. Put the soy milk, vegan spread and orange essence into a saucepan and set over a low heat until the spread has melted and everything has mixed together. Combine the flour, sugar, baking powder, salt and spices in a mixing bowl. Make a well in the middle and pour in the orange-milk mixture. Stir well until you have a thick batter. Spoon a couple tablespoons of the batter into each hole in your greased tray. Smooth the mixture level, then bake for eight minutes until lightly golden. Allow to cool slightly in the trays before transferring to a wire rack to cool completely. 4. Put the chocolate into a heatproof bowl set over a saucepan of simmering water. When melted, lift the bowl off the pan, allow the chocolate to cool slightly, then stir in the salt. 5. Remove the set jelly from the fridge and use a round cutter (just smaller than the cake bases) to cut the jelly. Lift the rounds onto the top of each cake base, then spoon over the chocolate. 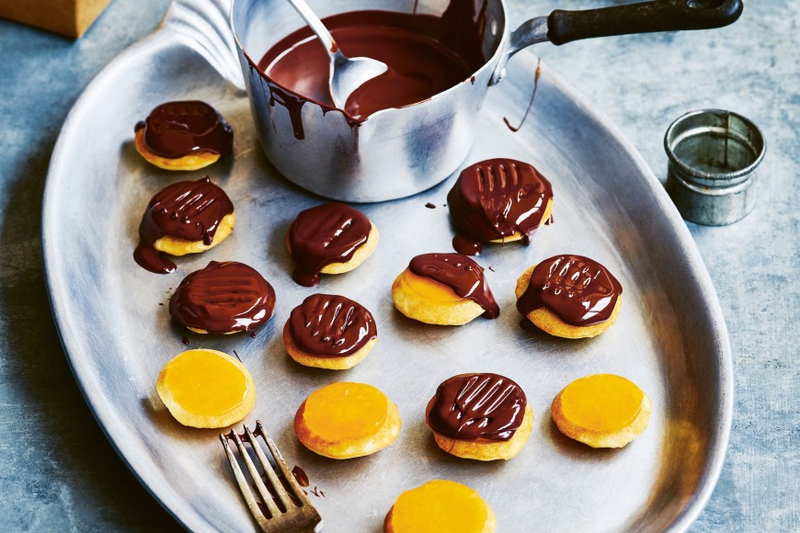 Spread the coated Jaffa Cakes out on a plate and allow to set completely in the fridge. It should take about one hour. They will keep for two to three days in the fridge. Vegan Christmas by Gaz Oakley is published by Quadrille, priced £15 (AED 70). Available online now.